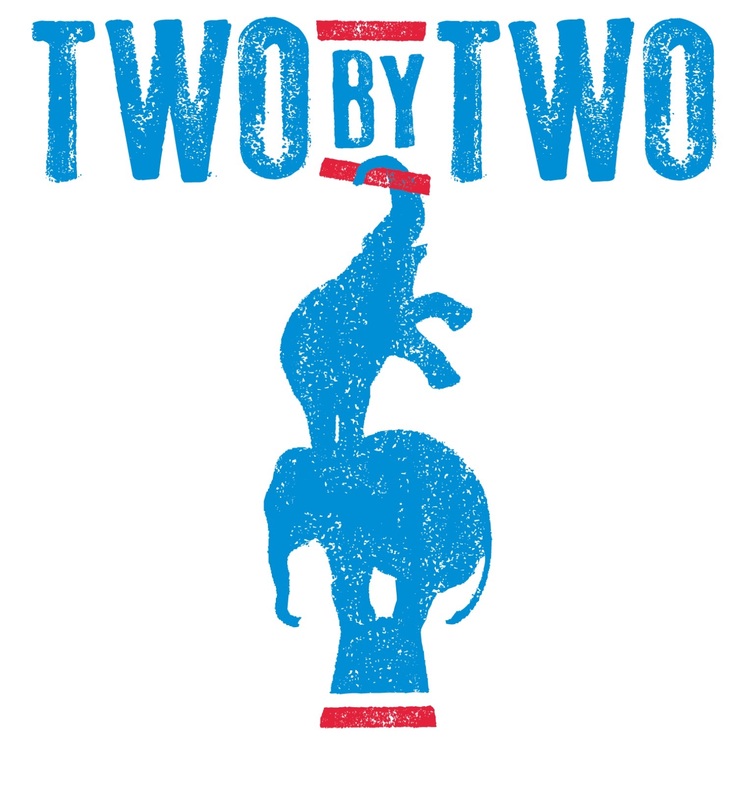 Today’s Q&A comes from Two by Two run by Zoe Taylor and Anna Chopping. 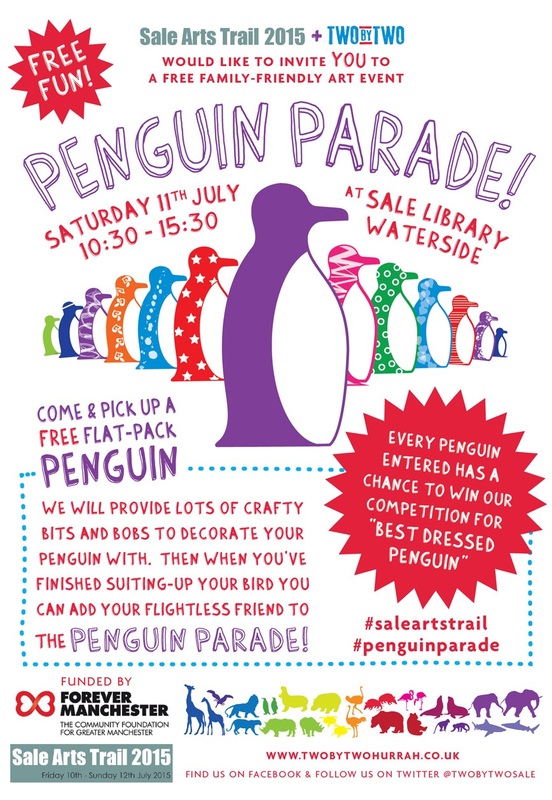 Two by Two are new for Sale Arts Trail This year and will be running the fabulous ‘Penguin Parade’ a FREE workshop from Sale Library on Saturday 11th JULY. Read on! Two by Two is a Sale based Community Group that organises local creative art events, inclusive family focused workshops, community arts projects and exhibitions. Creative, fun, collaborative, inclusive and animalistic! Zoe: plenty to choose from, here’s a few… Antony Gormley, Franscesca Woodman, Jo Spence, Picasso, Monet, Warhol, Dali, Banksy, Roy Lichenstein…. Anna: Daniel Eatock (clever, fun, graphics guy), Tom Messenger, Ron Arad, Frank Gehry and Mr Banksy. The Two by Two ‘office’ is in Anna’s loft. Tea, to do lists, emails, brainstorming and never enough time. We are currently working on a 12 month community arts project for an exhibition in Summer 2016, inspired by the story of Sale-born entrepreneur George Mottershead OBE (1894-1978), founder of Chester Zoo. George’s story is an inspiring tale of a local man, a hardworking, dedicated visionary man, responsible for creating one of the best zoos in the world. Sale Art Zoo will be an outdoor exhibition of over 30 life-size animal sculptures on display across Sale. These sculptures will be painted and decorated with original designs by a mix of workshop-led local school children, commissioned local artists, and other community groups. We visited and were blown away to realise just how many artists, designers and makers there were living in Sale. It was a revelation finding all this creative talent just bubbling beneath the surface of the town. The Trail’s success also revealed that Trafford locals obviously have a thirst for Arts events and it completely inspired us to want to be involved in Sale Arts Trail this year. How are you involved in SAT15? We will be running the ‘Penguin Parade’ workshop is free and all are welcome! Participants will be encouraged to ‘pick up a penguin’ and personalise its ‘penguin-suit’ using the mixed media materials provided. Penguins will then be invited to take their place in the Parade installation through Sale Library. All penguins added to the parade will be entered into the “Best Dressed Penguin” competition to win a prize. The first penguins to reside at Chester Zoo were Charlie and Sadie who tell a tragic tale. Charlie loved Sadie from day one; but she wasn’t too keen and it took a lot of fishing and waddling from Charlie before she relented and they soon had two chicks. Charlie and Sadie doted on them but Sadie quickly laid new eggs and grew very distressed trying to feed the chicks as well as sit on her eggs. One morning the chicks were found dead, eggs ruined and poor Sadie lay face down in the pool. Charlie was distraught. He wailed all night long and built nests, sitting on stones, hoping they would hatch. Zoo founder George Mottershead couldn’t afford to buy another penguin, but knew Charlie needed company to help him move on. The solution, most bizarrely was a rabbit! Charlie grew quite attached to the rabbit and was often seen nesting on his carrots. He still called for Sadie in the night, but thanks to his new rabbit friend was a much perkier penguin! !